Leopards are one of Africa’s big cats, and even more impressively, one of Africa’s well known Big 5. But what gives them such an honorable title? 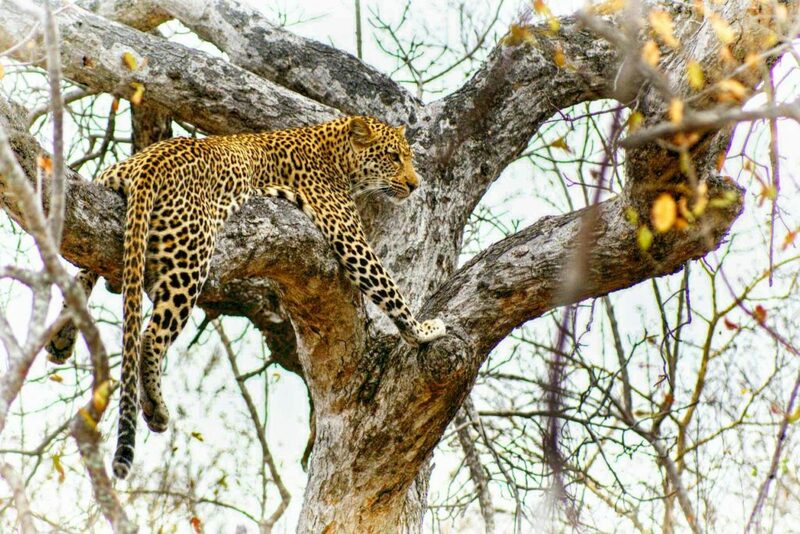 The leopard is known for its elusiveness, its agility, and also a very opportunistic lifestyle. They are extremely adaptable, able to live in a variety of habitats. They can be found in such extremes from the high temperatures of the Kalahari Desert to the freezing mountain ranges of the Himalayas! They have the widest range of all the big cats. But what really sets leopards apart is that they have extraordinarily powerful jaws, as well as exceedingly strong neck and shoulder muscles. These big cats are able to put these muscles to use by having the capability to lift prey that is two-three times their weight into a tree. They do this to provide protection for themselves and to keep their prey from being taken by other predators. As often times, scavenging lions and hyenas, will readily steal the leopards’ kill because they are larger than the leopard. So in order to avoid the other purloining predators, a leopard generally chooses to take prey that is much smaller than themselves, as it is easier to carry it up a tree, and so their main food source tends to be impalas, duiker, steenbok and any other smaller antelope. However, leopards being such highly opportunistic hunters, have been found to consume anything from insects and reptiles to rodents and large antelope. And even more impressively, though it is extremely rare, it has been reported that even small giraffes have been killed and drug into the trees by leopards! And so putting into perspective this amazing cat’s ability to lift prey two-three times their size, we can look at a leopard’s size. A male leopard weighs between 37-90kg (82-200lbs), which is larger than female leopards. And this means that a 200lb male leopard can technically lift 600lbs with its neck muscles alone. And, if that wasn’t enough, pull it up a tree. Would you like to try and lift 600 lbs with your mouth and climb up a tree? That’s why leopards deserve their place in Big 5, and that’s why Toro River Lodges is a Big 5 conservancy.